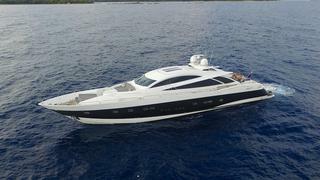 The 32.92 metre motor yacht La Dolce Vita, listed for sale by AJ MacDonald at IYC, has been sold in an in-house deal with the buyer introduced by Vangelis Filiadis. Formerly named Shore Thing, she was built in GRP by UK yard Sunseeker International and was delivered in 2008 as a Predator 108 model with a refit in 2013. Accommodation is for up to eight guests in four cabins consisting of a master suite with a dressing room and a steam shower, a VIP suite and two twins, all with en-suite facilities. In addition, there are two cabins for four crew members. Her neutral, soothing interior with satin cherry wood panelling is offset by carbon fibre design touches, light grey soft furnishings and a number of custom design features. The generous saloon area offers comfortable seating and an entertainment system — new in 2014 — including a 50-inch Samsung LED 3D television mounted on a rise and fall mechanical system. The spacious deck area has two bow sunbathing areas, complete with a spa tub. The cockpit has everything guests might need for leisurely entertainment and dining as she comes with a wet bar, ceramic grill and an ice maker along with upholstered settees and a table. In 2013 all exterior cushions were recovered in light grey Sunbrella fabric. The asking price included a 2013 Williams 445 jet tender, stored on a rise and fall hydraulic aft platform, with further storage available in the large garage. Twin 2,434hp MTU engines give her a speed of 33 knots and she is fitted with Trac fin digital stabilisers to eliminate roll motion under way or in port. La Dolce Vita was asking $1,999,999.